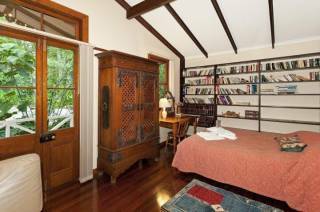 Save $25 per night!!! Free gift of sparkling wine on arrival. 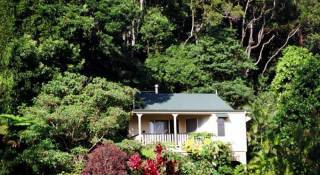 Secluded romantic rainforest cottage for two, breakfast basket, fresh croissants, fireplace and spa bath. Your perfect romantic escape. This is a limited time offer, Book Now! Book and pay 60 days or more in advance and save. Terms and Conditions for this rate. Booking must be paid in full at time of booking. No changes or cancellations allowed. Choice of individual pavilion not guaranteed at this rate. Boutique pavilions for couples nestled in sub tropical rainforest. Perfect for a romantic weekend, honeymoon, artistic sanctuary or simply a rest from everyday life. With gourmet food hampers delivered to your door on request all you will have to do is kick back in the hammock with a good book. Revive your senses and spirit with a swim in the saltwater pool, a massage in your pavilion, or just wander the forest trail and listen to the bubbling creek. We look forward to welcoming you to Narrows Escape. 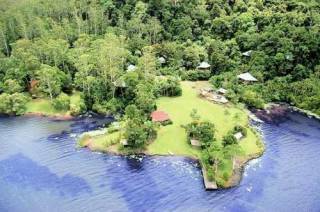 Discover the natural beauty of the rainforest in eco friendly luxury. With just six contemporary design pavilions, your seclusion is guaranteed, with birdsong and the tranquillity of ancient rainforest surrounding you. Delight in fully appointed kitchens, deep double spa baths, log fireplace and a verandah to soak in the views. 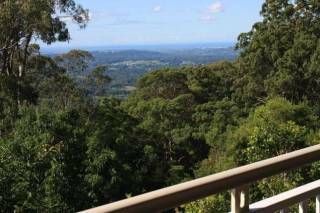 Located just one hour north of Brisbane, close to the beaches of Noosa and a short drive to Fraser Island, you are just minutes from charming hinterland villages, art galleries and wineries to delight your senses. Taste the finest regional produce at award winning restaurants or explore the myriad of walking trails at your doorstep. Pavilions all feature deep double spa baths, log fire, luxurious furnishings and beautiful rainforest views, well as all conveniences such as free high speed wifi, flat screen TV and Nespresso coffee machines. A welcome platter is placed in the fridge for your arrival if you stay with us for two days or more, and a myriad of little surprises will make your stay a memorable one. A gourmet breakfast hamper is supplied on arrival, with freshly baked croissants delivered each morning. Delicious home cooked meals or BBQ hampers can be delivered to your pavilion so you never need to leave your private rainforest haven.. These are our general terms and conditions. Special Terms a and Conditions may apply to specific rates that override these policies. We recommend travel insurance to cover unexpected circumstances. Please contact us directly for specific enquiries. Hosts Jenny and Kevin pay attention to the finest details to ensure your stay is full of heart felt touches. You will be greeted on arrival with a delicious breakfast hamper and then open your door each morning to fresh, warm croissants. 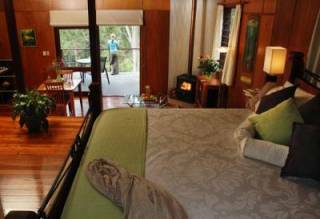 As owners, Joanne and Mark Skinner are proud of the achievements of Narrows Escape Rainforest Retreat and together with Jenny and Kevin, we continually strive to improve the experience for our guests.